For the 2016/17 NHL season the Toronto Maple Leafs are wearing at least 4 brand new jerseys, a brand new home and away set, a Centennial Classic jersey and a Toronto St.Pats throwback jersey. 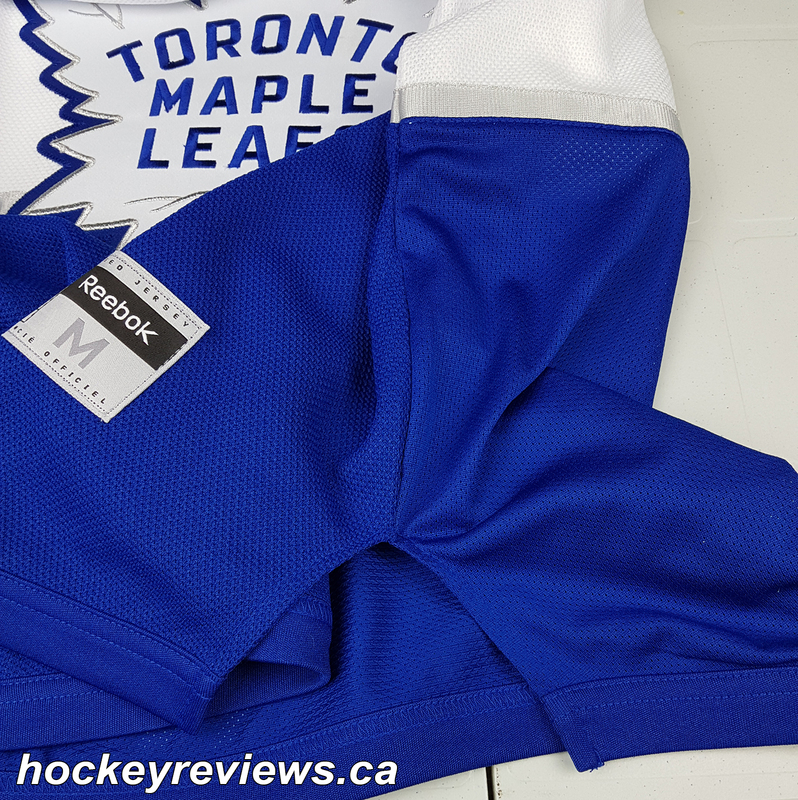 I live in Toronto Maple Leafs territory and their jerseys are fairly easy to find (except for the St.Pats so far, hence it lacking in this video and write up), and upon closer inspection I noticed a few oddities on these new Reebok Replica Premier Toronto Maple Leafs jerseys, which prompted me to write and film this comparison review. 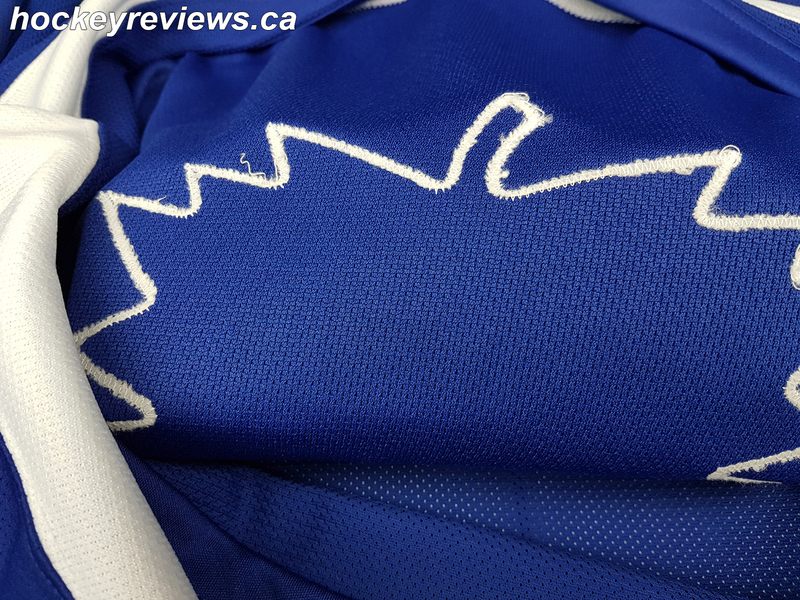 This was the jersey that peaked my interest in the new Reebok Premier Replica Leafs jerseys, I noticed the lower hem of the jersey to be one piece, and no longer split up the sides like the majority of Premier replica jerseys on the market today. The only jersey I could instantly compare at the time was a home Penguins jersey, which had the split down the side of the jersey consistent with most NHL Reebok Replica Premier jerseys. Since the Penguins jersey debuted in the 2014/15 season I wasn’t sure if the split along the hem was a carryover from previous Premier jersey templates. 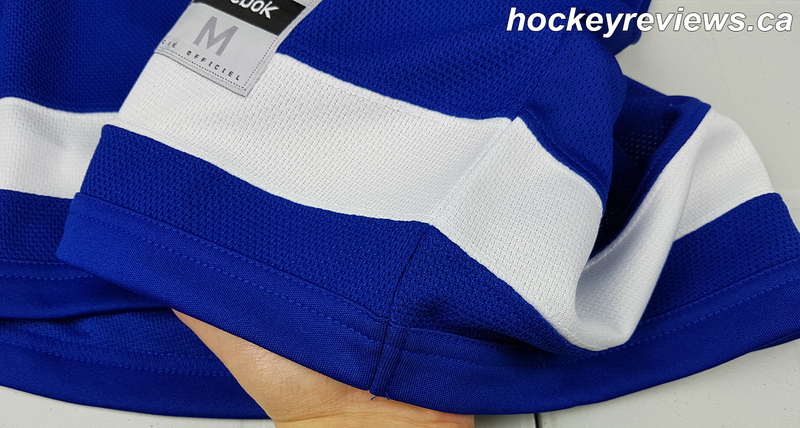 I did notice that the front crest was sewn onto the jersey, which seems to now be the standard with Adidas/Reebok Premier jerseys for the 2016/17 season as seen on the World Cup of Hockey jerseys and now the freshly released NHL jerseys. I also met up with a friend who is a huge Panthers fan, and his newly acquired home jersey also had the front crest sewn on instead of the previously glued and heat pressed crests. 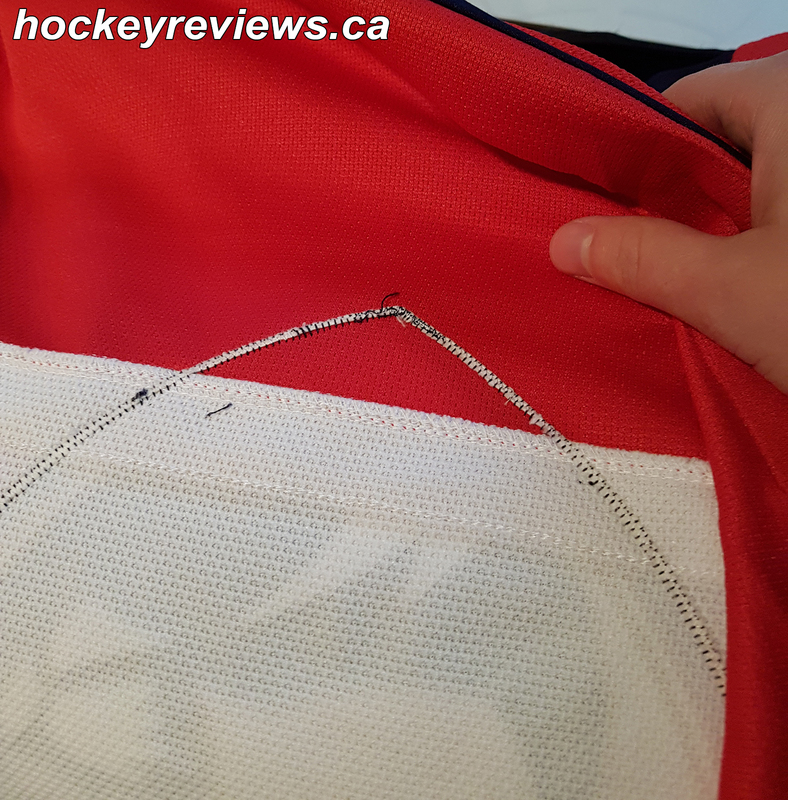 Unfortunately I forgot to check if the lower hem of the Florida Panthers Premier Replica jersey was split or one piece like the oddity that is the new Maple Leaf home and away set. The jersey does have a slight ducktail, but it is not as prevalent as it was on the earlier Premier jerseys. 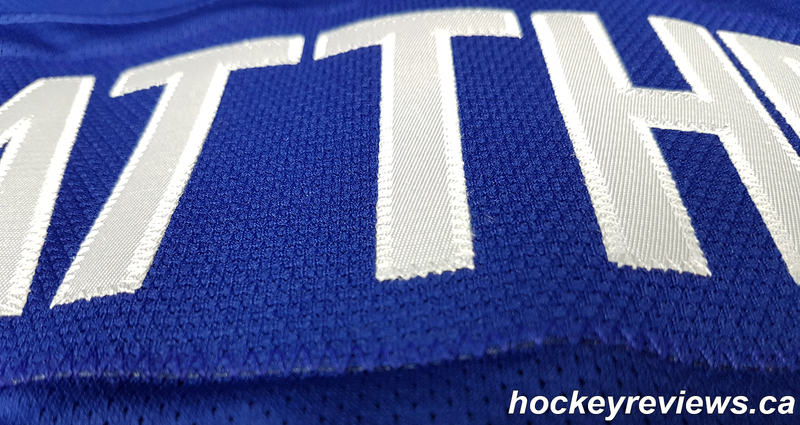 Besides the uncut hem of the jersey, the 2016/17 Toronto Maple Leafs home and away jerseys are a standard affair in terms of Replica Premier jerseys. The standard jock tag is visible on the lower right corner with the only other real standout is the text “Honour. Pride. Courage.” stamped on the inner back collar in a rubbery feeling material. 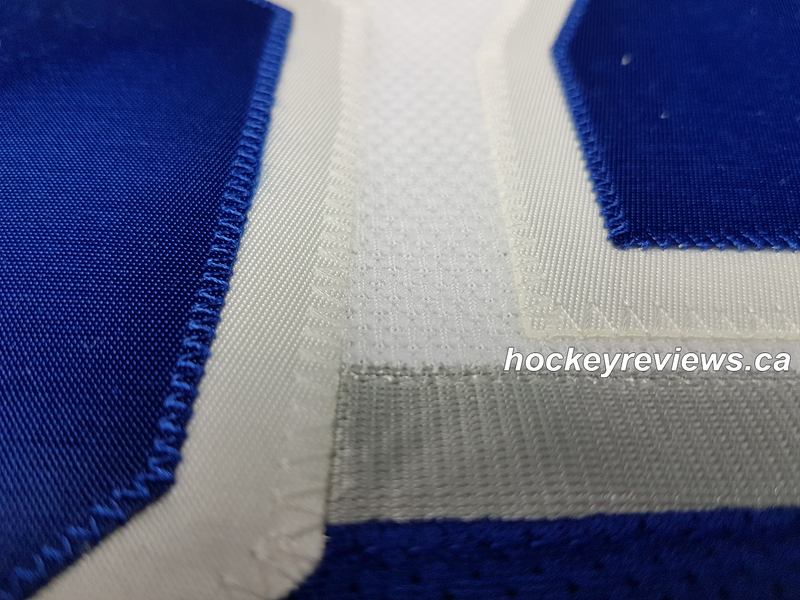 Please watch out for my upcoming series on NHL Replica Jersey History which discusses the different materials and styles that have been used when putting text on the inside collars. Uncut lower hem of the jersey. 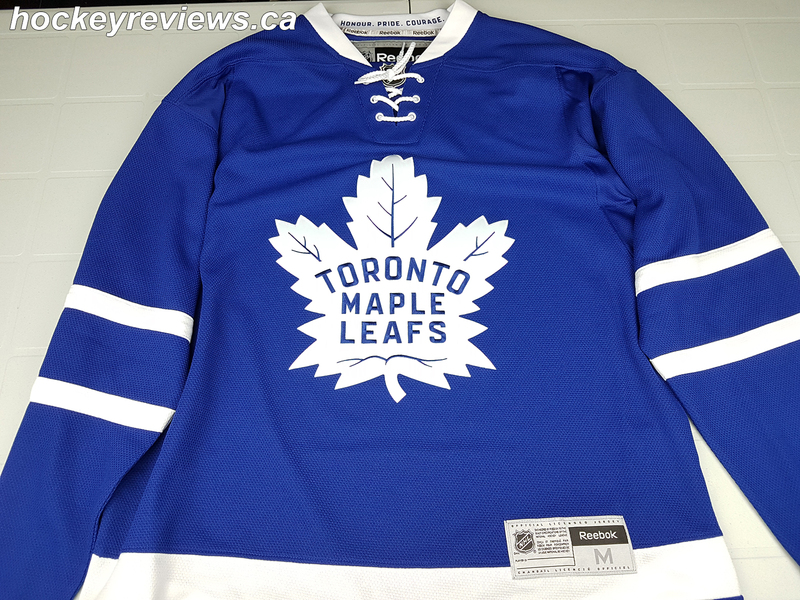 I was extremely excited when this jersey showed up in local stores as I wanted to compare the lower hem to the unique style on the Maple Leafs home and away jerseys (yes I live that boring of a life). 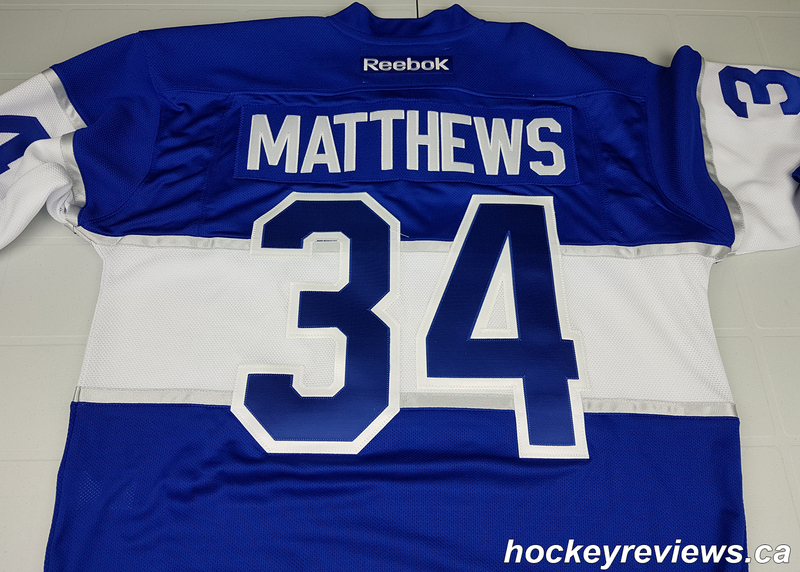 I was able to grab a customized Matthews jersey with surprisingly good customization with sewn multi-layered twill numbers and letters, but with the incorrect nameplate material. To my surprise, the Centennial Classic jersey has the more standard split hem on both sides of the jerseys where the front and back panels meet. This puzzled me more and made me take a trip up the highway to a sports store which would carry many more jerseys than my smaller towns selections. 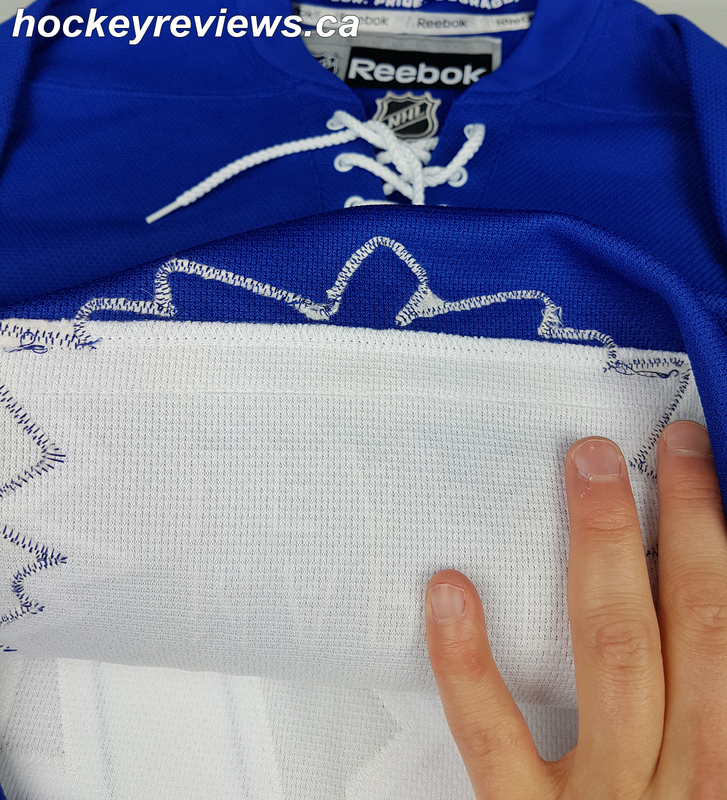 I was able to look at the hem of all newly released 2016/17 Replica Premier jerseys and I the only jersey with a similar style to the Maple Leafs home and away set was the New York Islanders black alternate jersey which has a unique “B” logo joining the front and back panels of the jersey. 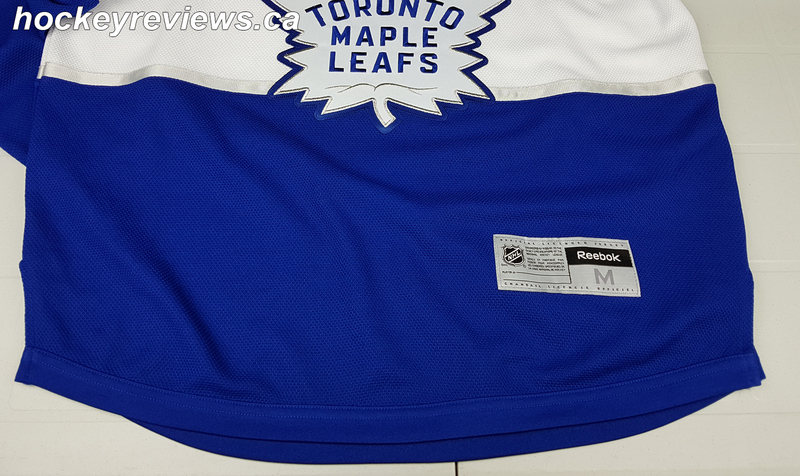 Besides the collar text identical to the home and away set, the Leafs Centennial Classic jersey is a standard 2016/17 Reebok Premier Replica. The 2016/17 Toronto Maple Leafs home and away jerseys are quite an odd design, since they don’t seem to follow the cut hem design as all others. 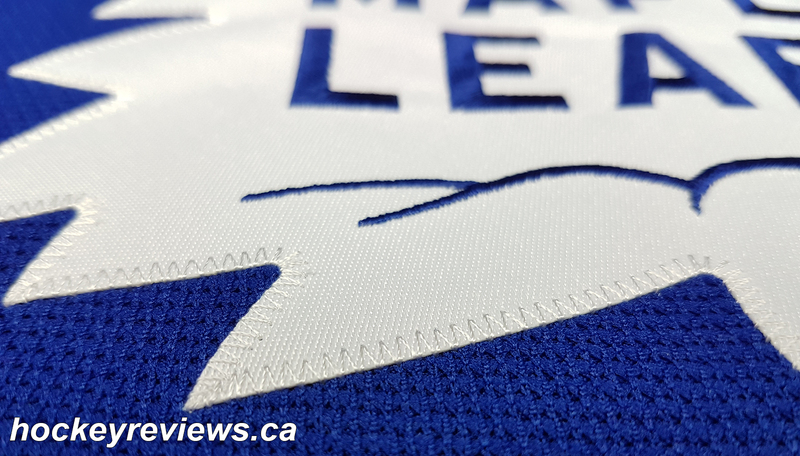 The promising detail of the newly introduced jerseys is that the front logo is finally sewn back onto the jersey, which ends up being quite a disappointment since Reebok/Adidas will not have the replica jersey rights for the NHL next year and we are unsure if the quality of jersey will go back towards the great replicas of the early 2000s or towards the more cheaply made fan style jerseys. 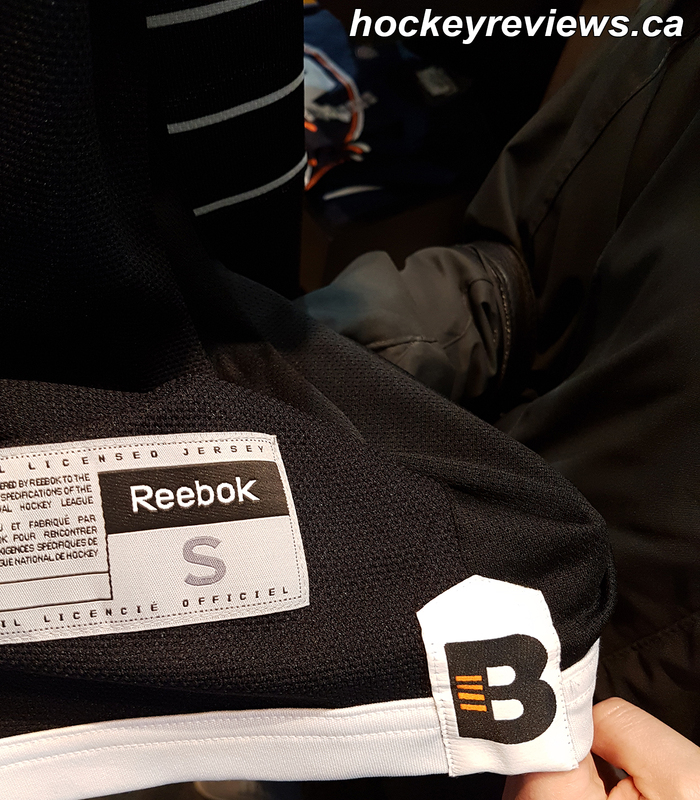 At least Reebok upped the quality for this last year by bringing back the sewn front logos. 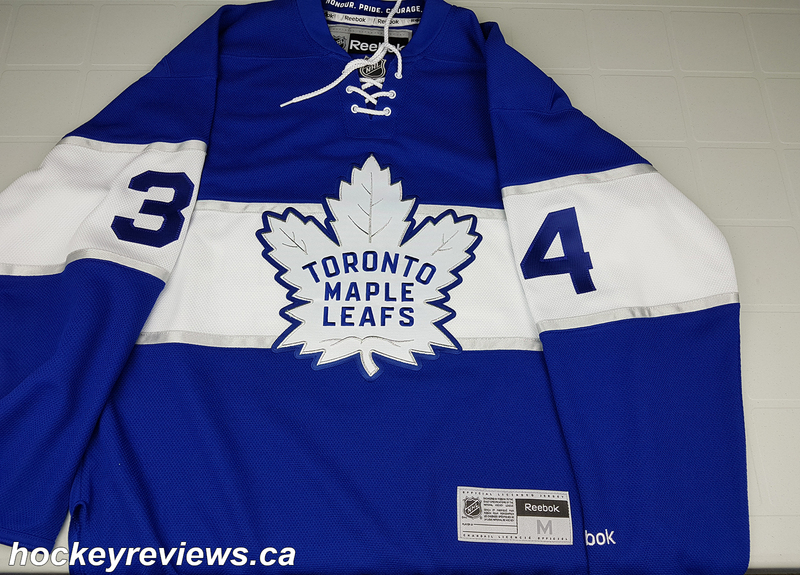 I would love to get my hands on a Toronto Maple Leafs St.Pats jersey but have yet been able to find one to make a quick video of, but I am curious to see if it follows the standard Reebok Premier template or throws us a knuckleball like the home and away Leafs set does. I truly wonder why this one set has a single hem without the split down the front and back panels, if you know or have insight I’d love to hear about it! While I also hate to promote my other things, it has become evident to me it is important to get a viewer base that will help me continue doing reviews like this (I can’t afford to always buy new equipment!). Hi. Thanks for the video. I was wondering if you were aware that there is no more Reebok. Adidas bought out the label in 2011 and stopped production. I’m assuming those jerseys are from a few years back before Adidas released theirs.